Before Rahul headed to Minsk Square in the city, where he interacted with HAL employees, the CM met him at Kumara Krupa Guest House. 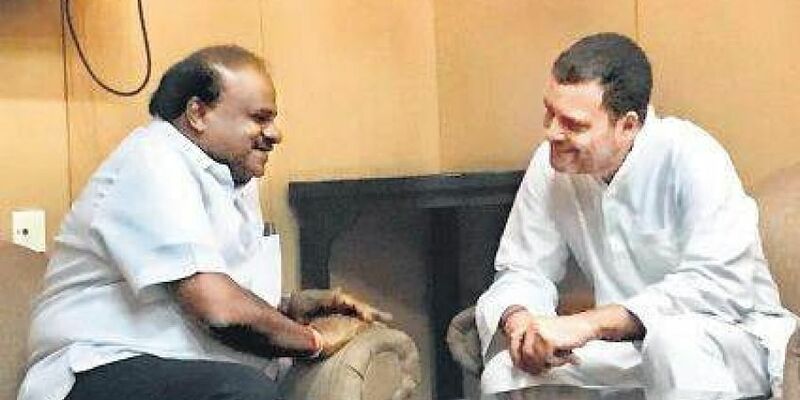 BENGALURU: Chief Minister HD Kumaraswamy on Saturday met Congress president Rahul Gandhi, who was in the city to interact with employees from the defence PSU Hindustan Aeronautics Limited (HAL). Sources said during the brief interaction, the chief minister is said to have briefed the Congress president about the by-elections and Primary Education Minister N Mahesh’s resignation. BSP leader Mahesh resigned from the ministry earlier this week. He, however, has made it clear that he will continue to support the JD(S) in the state.